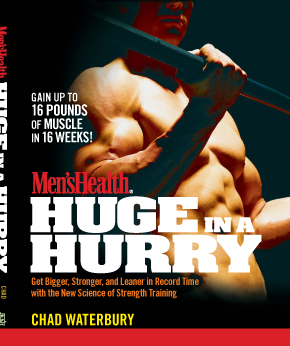 In December of 2008 my book, Huge in a Hurry, was released by Rodale publishing. The book has been a big success with tens of thousands of copies sold, and multiple translated versions around the world. If you’re someone who purchased the book, I really appreciate the support. And if you haven’t picked up a copy, I feel it’s one of the best resources to explain the science of heavy or fast lifting to build a bigger, stronger, leaner body. I’m biased, of course, but considering the quality of this 354-page, full-color book I think it’s a steal at less than $17. Now that the book has been out of quite some time, I’ve compiled a ton of feedback. Whenever I write an article or book, it’s my job to clearly explain my points and, most importantly, to outline the workouts in a way that leaves little room for confusion. Given the plethora of feedback I’ve received, apparently some workout descriptions weren’t as crystal clear as they should have been. Furthermore, there are a handful of cable exercises that people don’t have access to so I want to outline some alternatives. So I’m going to take this opportunity to clarify some of the confusion reader’s have had. It’s likely that if you had a question it’s going to be covered in the following explanations. In the Get Big Phase Ia (unloading) week it says “perform each workout once.” That unloading phase lasts one week. So you’ll do Workouts A, B, and C once during a 7-day cycle, and then move on to the next phase. Speaking of the Get Big program, there’s a typo on page 106. The load for Workout C should be heavy not light. So you’ll start with a 4-6RM and perform 25 total reps with 60-second rest periods for all Workout C exercises. Many people wondered why I’d prescribe 25 total reps with a load you could lift for 22 reps the first set. No wonder they were confused. This has caused me many sleepless nights because I didn’t catch the mistake in the final overview before it went to printing. If you happen to have a later version without the typo on page 106, consider yourself lucky. There’s one other error in the book, but isn’t a big deal. On page 110 the first exercise in Workout B shows a cable standing one-arm external rotation but the exercise description reads “cable standing one-arm mid-pulley row, palm up.” Which one is correct? Either will work but the description coincides with my original exercise choice. So if you want to be precise, perform the exercise shown on page 214 (#5) for the first exercise in Workout B on page 110 instead of the external rotation. If you have the book, you probably already know that I’m a big fan of cable exercises. The reason is because a cable allows you to manipulate the line of resistance, unlike free weights in which the line of resistance is always straight down. Plus, cables allow for natural movement patterns, much like free weights do. However, many people don’t have access to cables. I should’ve put an alternative free weight exercise next to each cable exercise, but I didn’t. You know what they say about hindsight. So here’s the complete list of cable exercises with an alternative for each. All lat pulldown exercises >>> do a pull-up with the same hand position instead. If you need assistance with the pull-up, place your feet on a bench in front of you to reduce the load you have to lift. All one-arm pulldown exercises >>> do a one-arm dumbbell row with the same hand/elbow position instead. All cable row variations >>> do a dumbbell row with the same hand/elbow position instead. This will be a one-arm or two-arm dumbbell row depending on the workout. All face pull exercises >>> do a dumbbell row with external rotation while lying facedown on a 45 degree incline bench instead. This will be a one-arm or two-arm row with external rotation depending on the workout. Explanation: let’s say a workout calls for a load that allows no more than 22 reps the first set. Use a push-up variation that you can’t do more than 22 times. That might be a regular push-up, a push-up with your feet elevated, a push-up off a Swiss ball, or a clap push-up. Any will work. In the Get Lean program, each workout ends with high-intensity interval training (HIIT). For example, in Workout A you’ll complete 20 total reps for the four strength exercises followed by 10 minutes’ worth of HIIT. Finally, many people have asked if they need to do the Get Ready program, a three-week program that’s recommended before you start any program in the book. I was adamant in the book that you need to do it. However, I’ll modify that answer. If you’ve performed any of my workouts in publications such as Men’s Health, Men’s Fitness, or T-nation, you can jump straight into any program in the book. But if that’s not the case, it’s best to start with the Get Ready program. Got any other questions about Huge in a Hurry that need to be cleared up? Post them here and I’ll be sure to answer them. This entry was posted in Ab Exercises for Men and Women, Gain Strength, How To Get Ripped by Dr. Chad Waterbury. Bookmark the permalink. Love the book!! On my second week on Get Big. I have always done Circuits but it was old school circuit training. Seeing results already at the age 40, but i am having one problem. Im 6’1 195 lbs I just can not eat that much. I try and eat 2 grilled chicken breast at lunch or 5 eggs for breakfast and I’m miseribly full. I have always ate 5 or 6 meals, but for the last 10 years my biggest meal was breakfast and my lightest would be dinner, and have almost eliminated all starches and grains. Should I use more protein powder to make up the protein difference? Thx in advance! CW: Read my Waterbury Diet for Muscle Growth post and do that instead. Awesome book, love HIAH! Quick questions on creatine. Is creatine a supplement that needs to be cycled off after a certain time period? Like take a week off every 4 weeks or so? Or is it ok to be taken every day? CW: It seems that 3-5g per day is fine without cycling. Just bought HIAH. However, the gym at my work ($4 a month) only has dumbbells and one barbell (no squat rack). Out of curiosity, will I get the same results from HIAH if I sub your cable exercises and your back squat exercises with front squats and dumbbells? What do you suggest? CW: Yes, you can get the job done without cables. CW: That plan is full body overall, while PM workouts are just for the arms, don’t add anything more. Just wanted to drop you a “thank you”. My wife and I both did the Get Big routine and we both gained lean mass. But the program that we really enjoyed was Get Lean. It was killer on reduced calories… especially the jumping jacks and squat thrusts. I’m 46 years old and in the 15 weeks it took to complete the program I maintained my lean mass of 155lbs and my bodyfat went from 20.3% to 14.1%… and for the first time since my early 20’s my abs are starting to show. My wife did great as well. Thanks again! CW: My pleasure – thanks!